SPONSORED BY RECORD COLLECTOR MAGAZINE! 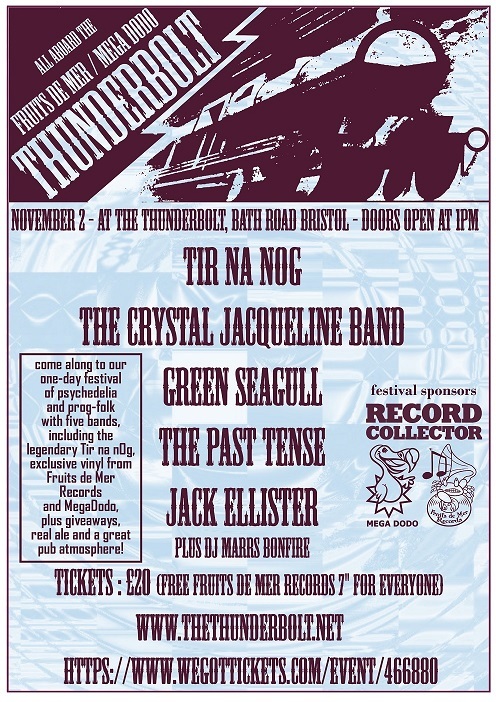 Limited to 150 absolute maximum, the Thunderbolt has a great reputation as a pub/live music venue - walking distance from Temple Meads BR station, which has a direct line into Birmingham, Cardiff, Leeds, London, Manchester and Scotland. Loads of hotels in the middle of Bristol - there's even a record fair in Bristol on the day of the festival! Although seating in the music venue is very limited, there's plenty of space for FdM and MegaDodo to set up stalls and offer you a few gig-exclusives (we're currently planning to launch a new single by The Past Tense at the gig, we'll have something from The Crystal Jacqueline Band that'll have you thinking we've lost it (once again) and there'll be a free FdM single for everyone - a 2019 single on a colour of vinyl you won't be able to get anywhere else! It all costs just £20 for five live sets - that's £4 per band - and the usual fun and friendly atmosphere you get from an event involving two labels with more money than sense, and no money to speak of. Record Collector magazine is kindly sponsoring the gig, so hopefully there'll be some good giveaways on the day - but there'll certainly be a nice big ad promoting the whole thing in the issue on sale at the end of May!